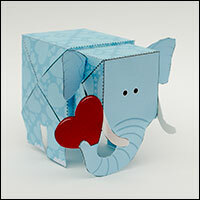 Valentine Elephant, Come and Get it! 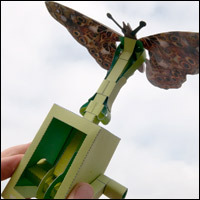 The project comes in three colour schemes and a mono version. 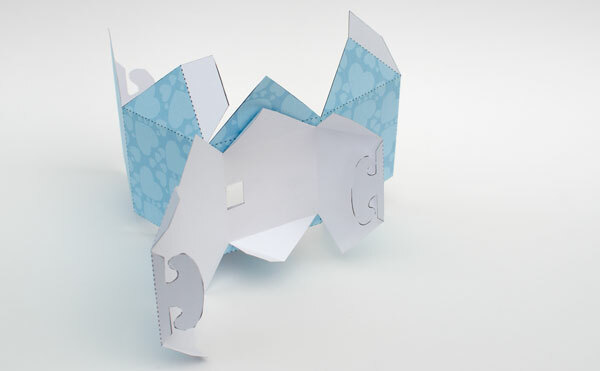 Print out the parts of the version you choose onto thin card. (230 micron / 67lb) Note that the last page of the colour projects is coloured on both sides. 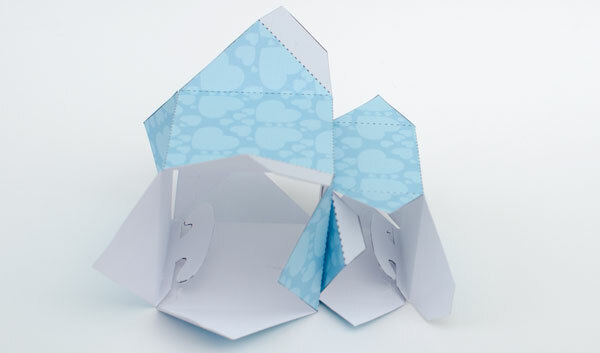 Print out one side, flip the card over, return it to the printer and print out the back. Score all the dotted and dashed lines then cut out the holes. Exercise the creases to ensure they fold easily. Glue the grey areas of the head and body together lining them up as accurately as possible. 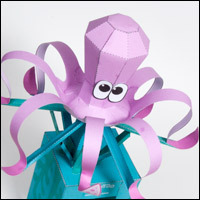 Fold the head and body round, glue the hooked tabs face to face to make double thickness card. Glue together the sides that are opposite the hooked tabs. 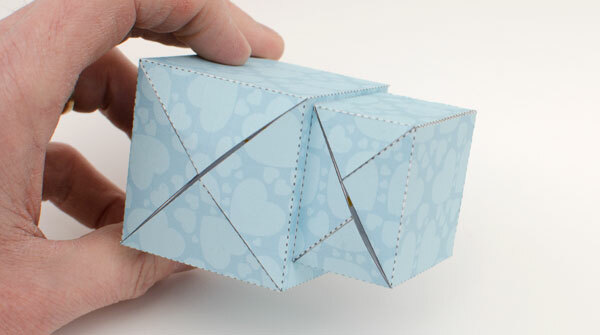 This will hold the box in shape but still allow you to access the hooked tabs to fit the elastic band in the next step. Select a long thin elastic band. 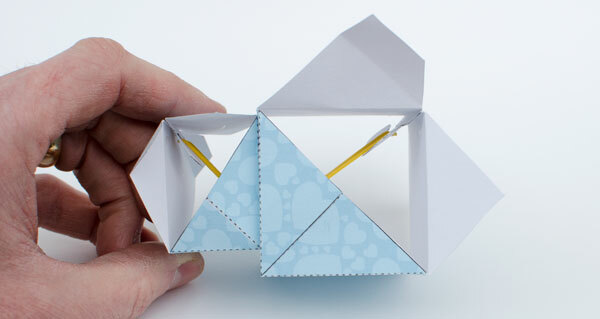 Hook one end over the smaller hooked tab, thread it through the hole in the box and hook it onto the other tab. Close the other sides by gluing them together. 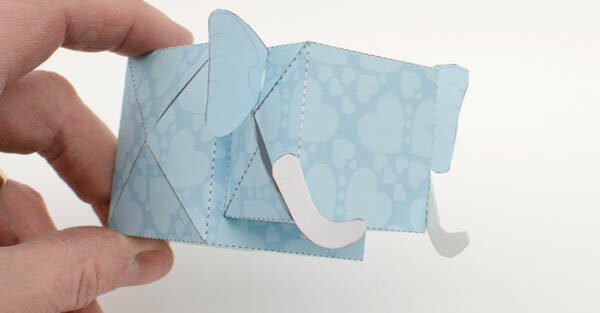 The tusks are double thickness card. 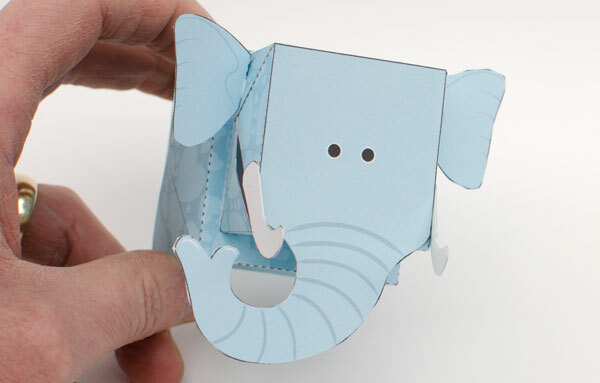 Make them by folding the card in half and gluing it together then carefully cutting out the pieces. 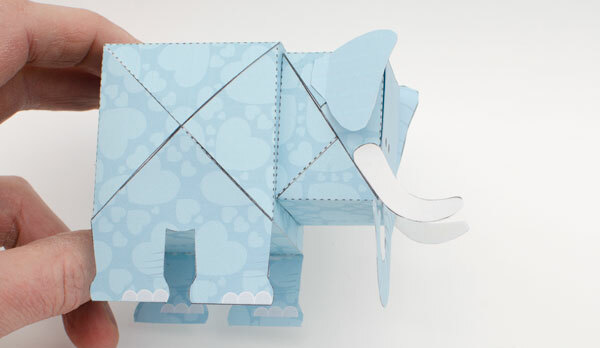 Glue on the tusks as shown so that their edge lines up with the diagonal edge of the side piece. Glue the ear tab in place so that it is vertical and central. Glue the face to the front of the box. 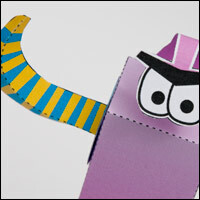 Glue the legs to the side of the box. Make sure that the toe nails are to the front of the foot. 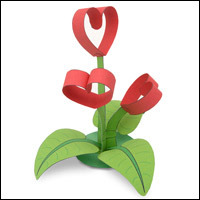 Finish off the model by gluing the heart to the trunk as shown. That’s it! 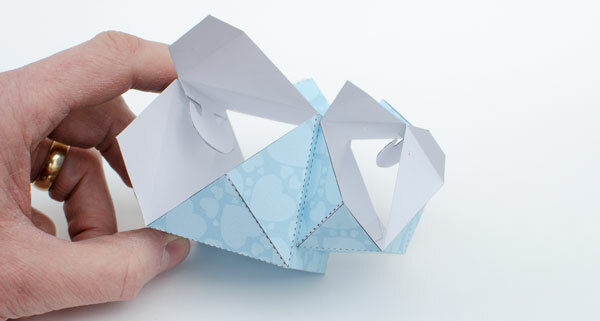 Fold the model flat, slip it into a Valentine card and send it to your one true love. 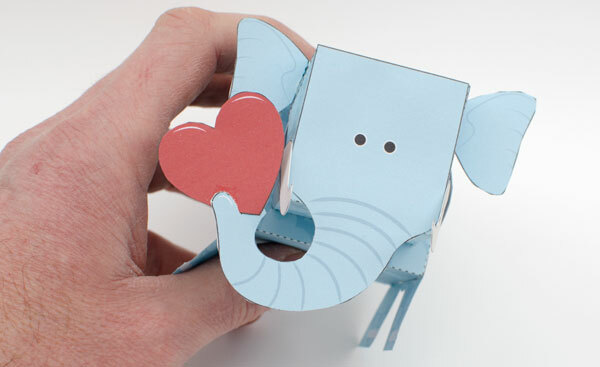 also you could make the pink and blue one and turn the trunk of one of them the opposite way then cut the heart in half and glue half to each one then when you put the too elephants together the heart would go together like a charm bracelet.one more thing the page with the back of the head, ears, and legs is not marked as a back page and i almost printed it out as a separate page so just marking those pages as back pages might be helpful to some. I've modified the file so that the blue elephant is flipped. I've also added a flipped face to the mono version. If you have already downloaded you can re-download at the link for the new version. Tomorrow is Valentine's Day. Before I give away the herd of elephants, I've done a photo of the family. The assembly of the models I have as always enjoyed. PS: In Africa, the mother elephants have well tusks. I loved this model from Rob Ives and all the Michael's changing. Congratulations!